The following is an edited excerpt from the book Love, Death, and Money: A Woman’s Guide to Legally Protecting Yourself by Naz Barouti. If you don’t have legal documents that specify what should happen after you die, the government has a plan for you. And you may not like it. If you die without a will or trust, it’s called dying “intestate” and your estate will go through probate. Probate is the legal process in which the court sees that your debts are paid and your assets are distributed according to your will. If you don’t have a valid will or trust, your assets are distributed according to state law. Well, the probate process is expensive, takes a long time, doesn’t allow for privacy, and your family has no control. Legal fees, executor fees, and other costs must be paid before your assets can be distributed to your heirs. Typically, the process can take anywhere from nine months to two years. I’ve seen, however, some matters that have taken over five years. In addition, probate is a public process, so any person can see what you owned. The process allows for various individuals to contest the distribution and claim they were owed a share. A gentleman died, leaving behind assets and an estate worth over $15 million that had not been placed in a trust. His wife had passed away before him, and they had three children who stood to inherit the estate. The government was the big winner in this case, as it took a huge chunk of the estate in taxes and probate court fees. The entire situation could have been avoided with proper estate planning. The father could have used the allotted lifetime exemption for gifting without having to pay taxes, and given the money to his children by taking advantage of the Federal Estate and Gift Tax Law. It allows an individual to transfer an unrestricted amount of assets to his or her spouse at any time, including at the death of the transferor, free from tax. Without this exception, the children were forced to sell the property just to pay the IRS. Unbeknownst to the children, their father had a child out of wedlock whom they — and he — knew nothing about. The child’s mother was underage at the time when she got pregnant and chose not to put the man’s name on her daughter Jane’s birth certificate. As an adult, Jane learned about her father when her half sister found her. She learned about his passing, and also that she could inherit from his estate. Jane filed a claim with the probate court because her father did not have a will. Turns out, there were several children the deceased man didn’t know about, and they all came forward as heirs for a piece of the estate. Jane certainly had to prove her case, using DNA evidence to change her birth certificate and prove to the probate court that she was a living heir, which she did. The court divided the assets among all the children, not just the ones the father had known about. They divided not only his assets, but also the ones he previously inherited from his wife. She had died without an estate plan, and he inherited her half of all joint assets of all their community property. Now their children had to share the combined assets of both parents equally with Jane and the other half siblings who came forward. In order to avoid all of this, what should have Jane’s father done? Even though they were married and held all assets jointly, he and his wife should have written a married revocable trust. Many believe that joint ownership avoids probate; however, it just postpones it. What would have happened if both of them were involved in a car accident and died? Don’t let joint ownership deter you from writing these important legal documents. Also, another key thing to remember is that with some assets, such as real estate, all owners must sign to sell or refinance. If one of the co-owners becomes incapacitated and there is no power of attorney giving you signatory authority, the court will get involved to name an agent to sign on your behalf (I will discuss this further in another chapter). As soon as his wife died, he should have transferred his 100 percent ownership of all assets into a trust, so if he died, it wouldn’t go through probate. Within the trust he should have documented, “I don’t recognize any other children.” While Jane was happy she got a portion of the estate, the three children certainly were not. When there is no will or trust, the courts decide how to divide the estate based on a specific formula, regardless of the heirs’ feelings or family wishes. They don’t care if heirs have a relationship with the family or not, and half relatives count as full relatives. 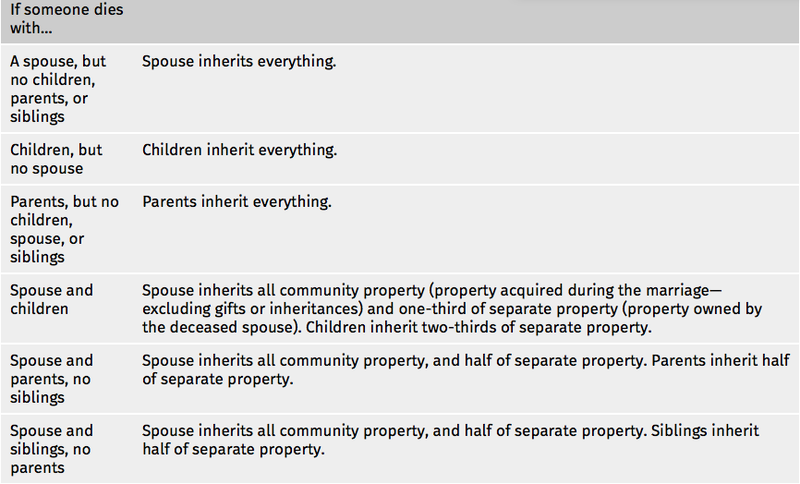 The following table details the flow for how an estate in California is divided if there is no will or trust. People are often shocked to learn how strict intestate laws are. They feel if they’ve been married to someone for thirty years, they should get to make the decisions about their assets, whether it’s community or separate property. Unfortunately, without a will or trust, that is not the case. It’s important, especially when you’re getting married, to know if your significant other is coming in with a lot of assets in just their name. This is considered separate property, and you are not entitled to all of it when your spouse dies, unless they specifically note you as the beneficiary in their estate plan. The court can only base their distribution decisions off of title and ownership of those assets. Many of the cases I see going through probate are situations where a married couple purchased a home, but the title was only in one name, mainly because one spouse didn’t qualify for a loan due to bad credit. If the couple didn’t create a trust, and the spouse whose name was on the property dies, the property has to go through probate court and unexpected things can happen. An estranged child, like Jane, can come in and say she’s entitled to two-thirds of the property, even though the living spouse has resided in the home and helped pay the mortgage for a decade. Or the in-laws can go to court and claim their half of the separate property. Unfortunately, in most of these instances, the surviving spouse can’t afford to continue making payments on the property, and it has to be sold to pay legal bills, taxes, and so on. There is a significant difference between wills and trusts, and you should know the difference. A will may not be the best decision for you and your family because a will does not avoid probate when you die. A will must be validated by the probate court before it can be enforced. In addition, a will goes into effect after you die, which means it provides no protection if you become incapacitated. This, in turn, allows the court to take control of your assets before you die. The solution in avoiding this scenario is having an attorney draft a trust. It avoids probate and lets you keep control of your assets while you are alive, incapacitated, and even after you die. I think of a trust as a piggy bank. You take all the assets you own and put them in the piggy bank, and you are the manager of that piggy bank while you’re alive. You can take money out, spend it, even give it away. You can sell the assets in the piggy bank. Then, when you die, someone else steps in and manages that piggy bank and distributes the contents according to your instructions. I should note here that even if you have a trust, you will need a “pour-over” will that collects all assets you forgot to transfer into your trust and pours it over to your trust. Also, the will names a guardian or guardians for minor children. There are two types of trusts — revocable and irrevocable — and it’s important to know the difference before choosing the one that best fits your situation. A revocable trust is the most common type of trust and is one that you (the grantor) can change at any time. It’s the type of trust that most people establish, because they want to have flexibility and control over the assets as changes occur. You may buy or sell new items, businesses, and/or properties that you want to add to the trust. You may find that your relationships change — with your spouse, your children, or your family members — and you want to have the ability to update your trust and make the proper edits as needed. An irrevocable trust is the opposite of revocable — it’s not meant to be changed, except in special circumstances, and then only by the trustee and/or beneficiary. You do not manage it; you select someone else to manage it. We often see clients using an irrevocable trust for asset protection, a way to secure their assets in case they get sued. As long as the assets are placed in the trust, they are protected. They can continue to provide for beneficiaries beyond the reach of any creditors; however, these trusts are not right for everyone. There are tax disadvantages, and these trusts can limit the client’s control and use of the assets transferred. People who use irrevocable trusts are usually those with a high net worth, or older people attempting to secure their assets because they don’t want anyone — children, family members, business partners, and so on — to force them to change the trust. Let’s say they’ve paid off real estate and want to transfer it into an irrevocable trust. They put it in and it’s done! They don’t have to worry about lawsuits, because creditors cannot access an irrevocable trust. However, it is important to note that irrevocable trusts should be set up before a lawsuit or potential lawsuit. The timing of the distribution of an asset into an irrevocable trust is key. The court will often consider the transfer of an asset into an irrevocable trust fraudulent when there is a pending lawsuit. The certificate of trust is a key component in using either kind of trust. It is a document created that contains crucial information about the trust without divulging personal details. The certification of trust — or trust certificate — contains primarily the trust’s name, date of creation, grantor(s) identification, current trustees, trust taxpayer ID number, and the trustee’s powers. If after setting up the trust you purchase a new home or obtain a new bank account, you can use the certificate to transfer title and ownership into the trust — opening the piggy bank and adding more assets to it. 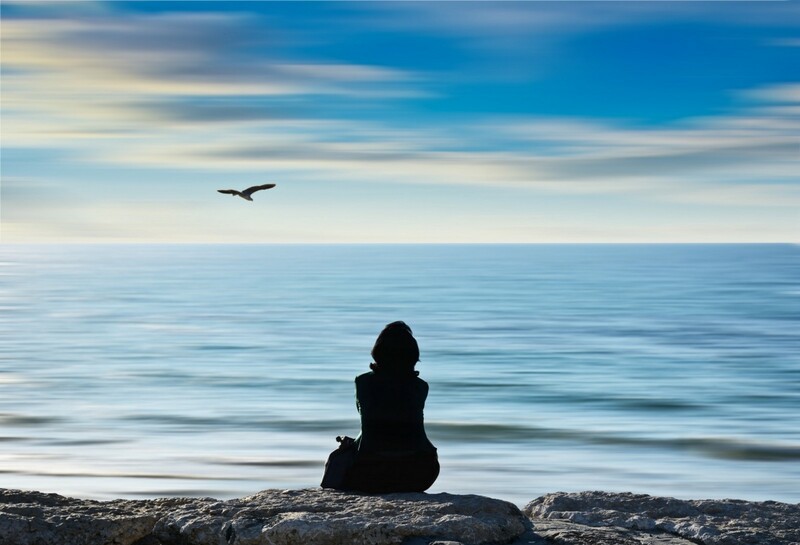 Many people think estate planning is only set up to be utilized when they’re dead and gone. That’s not the case; there should be two other essential documents in the estate plan or package that an attorney creates for you that can assist you while you’re alive. The durable power of attorney defines who steps into your shoes financially when you become incapacitated. This document determines who is able to sign your checks, talk to the IRS, and work on your behalf with financial institutions. There are two different types of durable power of attorney: one that gets triggered when you’re incapacitated, called a springing power of attorney, and one for when you want someone to be able to sign for you at any time. The springing power of attorney role is important, even if you’re married. Your joint assets can’t be controlled if you’re incapacitated. If your spouse needs to sell assets or sign documents, they wouldn’t be able to do so for you without this power of attorney. This second type is typically used by people who travel a lot for work and need someone to make financial decisions for them regularly. They’re not in one place at one time and want someone to be able to buy and sell real estate, or sign checks, for them. They can give power of attorney to someone immediately and don’t have to be incapacitated for that person to sign on their behalf. The advance healthcare directive, also known as a living will, allows you to define healthcare decisions in advance of a situation where you might be incapacitated. Your healthcare directive can cover any of a variety of medical topics specific to your views and religious beliefs. For example, some people’s beliefs prohibit blood transfusions or require confirming with a religious official before removing you from life support. With an advance healthcare directive, even if you were unconscious, the hospital will know not to give you a transfusion. Some people don’t believe in organ donation, or there are religious elements to be considered for their medical decisions, choice of doctor, or burial arrangements. Those can all be documented in the advance healthcare directive. Another part of the advance healthcare directive is the HIPAA authorization, which allows doctors and hospitals to release medical information to the person whom you’ve selected to be your decision maker if you’re incapacitated. It’s important to name this person when someone has a rare condition or an illness, as they will need access to medical files to make health decisions. Unfortunately, even a parent or close relative can’t get access without HIPAA authorization, as per federal law. In my opinion, the advance healthcare directive is probably one of the most important parts in the estate planning process, because people are often more opinionated about what happens to their bodies versus their “stuff.” It’s important for all those involved, as in the case of Kerri Kasem; her stepmother was the agent for her father’s healthcare directive and kept the children from seeing their father in the hospital. Yes! You need a lawyer when setting up your estate plan. This is not the time to be stingy. Many avoid getting these documents because of the cost, but the unexpected can happen (like we saw with Jane’s story). It’s imperative that you set aside money to get your estate planning done the correct way. Don’t use online services, because you may download the incorrect paperwork, fill it out incorrectly, or otherwise miss important steps in the process. An attorney who prepares the documents makes sure they are done correctly and makes sure they are validly executed and can hold up if contested. In the next few chapters, I will show you how to get a qualified lawyer, start things off on the right foot, and learn what you should expect to pay so that there are no surprises. When an attorney prepares the documents, they ensure that everything is done correctly, is validly executed, and will hold up in court if contested. To keep reading, pick up Love, Death, and Money: A Woman’s Guide to Legally Protecting Yourself by Naz Barouti.